Advertising in today’s market is more important than ever with hundreds and even thousands of competing products. Successful companies need to retain current customers as well as increase their clientele by promoting their brands through established products and services. To increase brand awareness, expand small businesses, and continue to promote products and services, consider these three forms of marketing: billboards, vehicle wraps, and mass mailers. Billboards: Everyone sees billboards even without consciously reading the advertisement. Billboards on the sides of skyscrapers, in busy cities, or next to freeways and main artery streets are an effective form of advertising. However, production and installation are quite costly, and depending on location and other variables, monthly fees may vary as well. A billboard, in a popular area, allows thousands of drivers and pedestrians to view your brand, company, and special offers, thereby leaving lasting brand impressions. Vehicle Wraps: Similar to a billboard, vehicle wraps allow large targeted populations of consumers to view brands daily, on the streets and personally. Vehicle wraps, unlike billboards are most cost efficient for a one-time production and installation fee per vehicle. A company can then choose how many vehicles to wrap and thereby how many people are likely to see the advertisements. 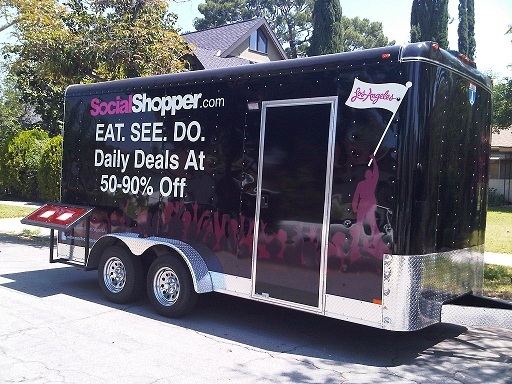 A fleet of wrapped vehicles covers more area and increases the likelihood of new customers because people interact with the brand on a more personal basis. Mass Mailers: To target potential clients in a specific area personally, mass mailers may provide the solution. Sending out a flyer to residents in a specific zip code can help benefit businesses and residences directly around a company’s location. Whether you are featuring discounts, grand openings, or new product information, mass mailers are cost efficient and tangible. Whatever the need or budget, Global Creative Studios has a solution to all marketing and advertising problems. Choose Global, and let us show you how it’s done.